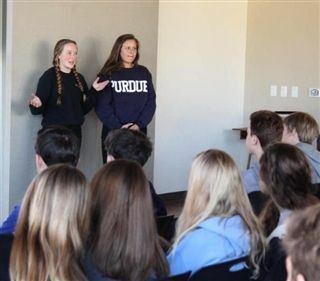 On Tuesday, March 8th, all 34 Upper School Service Learning groups participated in panel reviews designed to showcase progress, solicit feedback, and recruit new members. Each group created a short video to demonstrate its daily activities and overall mission. After viewing the films, group members answered questions from panelists including 9th-grade students, faculty and staff. Ninth graders embraced the opportunity to learn which service learning groups fit their interests and talents. At the end of April, freshmen will decide whether to join one of the existing service learning groups or propose a group of their own.